The National Pollutant Release Inventory (NPRI) gathers information from every facility releasing contaminants, such as paper mills, waste treatment plants, hospitals, military bases and oil and gas facilities. According to the NPRI’s data, Alberta accounts for 41 per cent of the country’s polluters, with 3,311 reporting facilities in 2010. Eighty per cent of those Alberta facilities are oil and gas producers. … In 2007, a report commissioned by the Canadian Council of Ministers of the Environment found the total remediation costs of soil and water contaminated by petroleum hydrocarbons (PHCs) alone to be almost $41 billion. 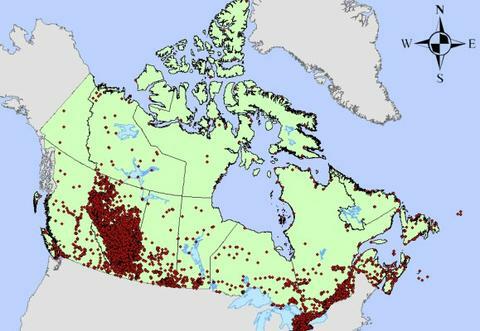 The 2010 soil quality guidelines report, also commissioned by the Canadian Council of Ministers of the Environment, found that despite knowing many PHCs and related chemicals cause cancer, and that there are hundreds of different types of these compounds, little toxicological information exists for most of them. Because of this dearth of knowledge, the environmental and health risks of only nine types of PAHs were examined for the soil quality review.